The Minister of Power, Works and Housing, Mr Babatunde Fashola, says Nigeria can generate 12,000 megawatts of electricity, once the challenges confronting the power sector are addressed. 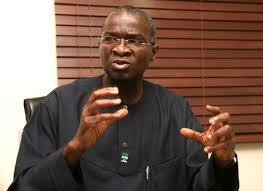 Fashola said this at the News Agency of Nigeria (NAN) Forum in Abuja on Wednesday. He said that in spite of the challenges, the nation’s power sector still had the ability to advance its power generation, transmission and distribution through other sources. “There are many perspectives to do this; we have today the capacity to generate at least 12,000 megawatts. `If we fix all what is not working; let us even say that we are not building any new power plant, anything close to 12,000, we can do. He explained that the nation’s power generating capacity had reached 5,000 megawatts before the recent vandalism of gas pipelines. “The only reason I announced 5,000 this year that we have reached this bus-stop; because I was already heading to another bus-top, until we had the outages and blow up at the Chevron platform. “Just as we were hoping that will soon be completed and we will get back on, that took us back to 3000. “Then we were looking at ways to bypass and evacuate our condensates, so that we can get more gas, we had reached about 3,800. “Then they hit again the Chevron pipeline in Escravos, the oil platform and also now the gas pipeline, the Excravos Lagos pipeline system, deliberate sabotage, took us down to 2,500 megawatts. Fashola, however, said that significant progress was being made to proffer solution to the challenge of electricity generation in the country. “Now, a lot of progress has been made in the last eight to nine months in terms of automating and strengthening the system. The minister said that it was practically possible to restore the 5,000 megawatts and improve the electricity situation in the country. He said that the adoption of renewable energy sources, regular maintenance of power plants and repair work done at the transmission stations were processes needed to improve electricity in the country. On what has been described as crazy billing by Distribution Companies(DISCOs)to consumers, the minister advised consumers to pay for what they actually consumed and demand for metering, while also urging on the DISCOs to meter the consumers. “You are not obliged to pay for power that you do not use; those who have meter do not have problem. “If you get a crazy bill, you must pay what you think you consumed. “Once you do that, the new tariff protects you from being disconnected; it is the burden of the service provider to prove that you used the power. “How do you prove that you used the power, you have to measure the power; for you to measure the power you must give me a meter. He said it was important to accelerate gas production in the country. This, the minister said, could be achieved by giving access to private companies involved in the business of gas production. “We need to open up more access, there are companies who are interested in producing gas for our domestic economy and I think we should give an opportunity. “There are companies interested in harnessing gas that is being flared on constructive arrangement with joint venture and on profit sharing on wells where there is oil production and gas production.